MOSCOW (Sputnik) - At least 19 civilians have been injured and 15 security personnel killed in three separate attacks in Afghanistan, the Pajhwok Afghan News agency reported. According to the TOLO broadcaster, 12 more Afghans have been killed and 31 injured in a fourth attack, a suicide bombing in the south of the Afghan capital. An attack on a local education department in the Afghan city of Jalalabad in eastern Nangarhar province took place at around 10 a.m. (05:30 GMT), on Monday leaving at least 10 civilians injured, the Pajhwok Afghan News agency reported citing the governor’s spokesman Attaullah Khogyani. One of the attackers was reportedly killed by a blast of the explosive device he had detonated while three other assailants were shot by the security forces. In a separate incident, 15 Afghan security personnel were killed by the radical Taliban movement in Kunduz province, the same agency reported. Moreover, another attack on Monday in the Chaparhar district of Nangarhar province reportedly claimed the lives of 14 civilians. This attack, however, was not the last one in the string of incidents Monday. At about 1:00 p.m. local time (08:30 GMT) an explosion happened next to the Ministry of Rural Rehabilitation and Development (MRRD) in the Darulaman area of Kabul. According to the preliminary data, the blast occurred while employees were leaving the ministry's building, killing 12 and wounding 31 more. 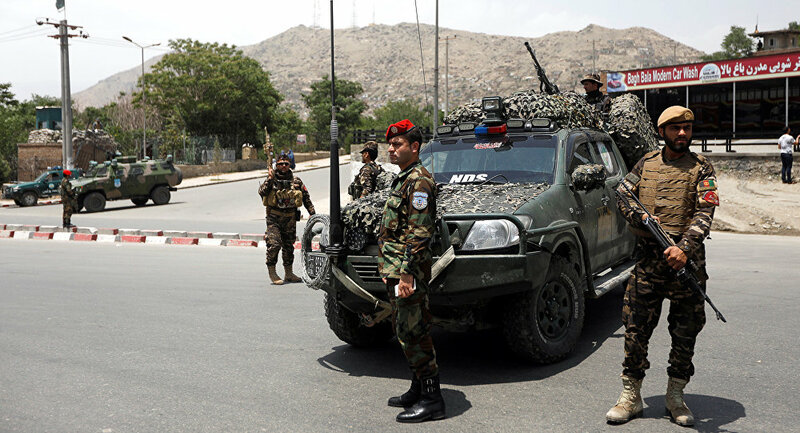 The attacks took place ahead of the ceasefire between the Afghan government and the Taliban movement, timed to Eid al-Fitr, the Muslim holiday marking the end of the month of Ramadan. The truce was announced by Afghan President Ashraf Ghani on Thursday and supported by the Taliban on Saturday. Ghani said the ceasefire would not prevent the security forces from carrying out their operations against the Daesh terror group. Although no official date of the ceasefire had been announced, local press outlets indicated Tuesday as the first day of the truce.